Iconic members of the Star Wars cast of characters can be turned into equally iconic comestibles, thanks to Williams-Sonoma’s new sets of Star Wars cookie cutters and pancake molds. The tools, which according to Williams-Sonoma’s Website were forged by a “Jedi Master chef,” feature molds for Yoda, a Stormtrooper, Darth Vader, and Boba Fett (albeit only in cookie cutter form). In addition to cutting cookie dough, the cookie cutters also have a stamp die that creates the face of the character on the cookie itself. The molds work by providing a solid metal barrier for pancake batter so they don’t spread out on the griddle, thus creating the shape of any given character. According to user reviews on the Williams-Sonoma Website, Yoda is the easiest pancake to flip. All in all, these gadgets look like the perfect complement to a geeky kitchen. 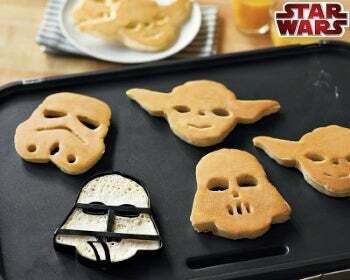 After all, why not munch on Darth Vader’s head for breakfast, and Yoda’s ear for dessert? Each set of kitchen tools costs $19.95 at williams-sonoma.com. Which one is your favorite? Are these the cookie cutters you've been looking for? Tell us by leaving a comment below.